The March MMMM challenged solvers to find a hit from 1980. The grid contains four theme entries, all hit songs (DESPERADO, DON’T BRING ME DOWN, DELTA DAWN, and DANCE HALL DAYS), as well as an additional theme entry, UTTER NONSENSE, clued as [Poppycock, and (in a way) what you need to do to solve the meta]. The “nonsense” is located in “D” syllables from each of the four song titles. Concatenating them gives De Do Do Do, De Da Da Da, the Police hit from 1980, and this month’s meta answer. Coming up with the meta answer is definitely easier if you know the song. If you never heard it, it’s not overly hard to find “De Do Do Do, De Da Da Da” using Google, and a number of solvers ended up doing just that. A total of 208 solvers puzzled their way to the correct answer. The average rating for the puzzle was 3.91 stars out of 5, with an average difficulty rating on the easy side, at 2.65 out of 5. Katiedid I found it by googling 1980 hit with nonsense. It was #10 on a list of the top ten songs with nonsense lyrics. genefaba You know, since they put a comma between Do and De, the words must not be utter nonsense. Just mostly nonsense. Shawn P That was the most enjoyable aha moment I have ever had. GWINNS and Tyler Hinman also really liked this month’s aha moment. Stribbs I used this song as an 8-point answer in Scattergories and ruined family game night once. You had better luck than Matt Gaffney – see his review here. ab Main construction issue is the stray DEs and DOs outside the song title theme entries, but that’s a minor quibble. Agreed – it would have been a little more elegant to avoid them. fheaney suggests cluing BUSHEL as [80% of the amount I love you, in a Doris Day song]. Matthew G. suggests cluing SOO as [Broadway actress Phillipa who was the first female lead in “Hamilton”]. I don’t think she’s appeared in a crossword (yet!). ASB suggests variants of both of these. Evan suggests cluing SPLENDID as [“___ Isolation” (Warren Zevon song)]. imfromjersey suggests cluing ENOLA as [OMD song “___ Gay”]. Howard B Nice puzzle (eloquence escapes me). 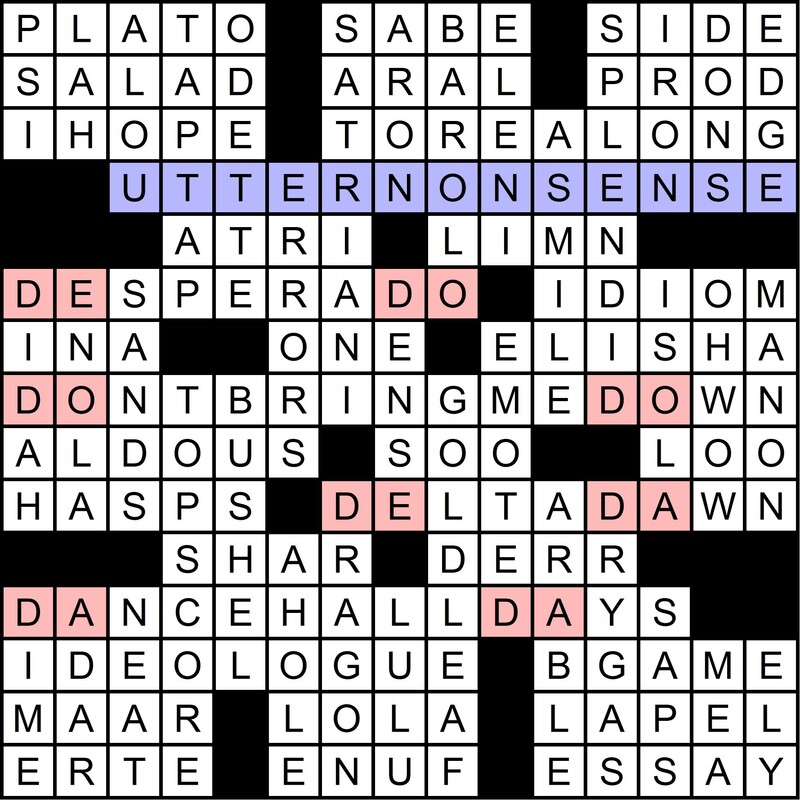 ConvolutED Puzzlers and post-punk musicians / Crosswords that intersect their missions / Clues that spur the competition / (To) Sunday’s deadline for submission. Maybe rewriting song lyrics could become a new comment category? Let’s see if this starts a trend. yosser Don’t think me unkind, this wasn’t too hard to find. (actually a fun solve). Todd G I solved it on a Thursday and my heart stood still (oh, wait, wrong song)… it also helped I was actually familiar with the song. Call it Synchronicity. This month’s randomly chosen winner of an MMMM coffee mug is Eugene Faba from New York City. 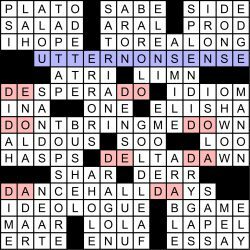 Thanks to Matt Gaffney for blogging the puzzle at Crossword Fiend, where you can rate the puzzle and/or leave a comment. Thanks for playing and see you in a month!